Colonia, Yap – Guam’s Track and Field athletes wrapped up their Micro Games competitions Thursday evening by bringing in 10 more medals on the final day, which brings their total medal count to 36! The relay team of Shania Bulala, Madison Packbier, Richelle Tugade and Celine Amparo had already set a new Micro Games record in the 4×100, but Thursday’s 4×400 turned into quite the spectacle. Bulala, Tugade and Amparo had just finished running a 200m event before the 4×400 which left the girls running on sheer willpower in the final heat. Bulala was the first leg and she was motivated to show up after not getting gold in the 200m. “The 200m is my race and I didn’t get the results I wanted. Even though I’ve never run a 400m in an event, so I was nervous, but I used the motivation from losing the 200m to do it. It was a team effort and I have to give credit to my teammates for the job they did out there,” said Bulala. Packbier took the teams first handoff and managed to give Guam a noticeable lead from 200m out despite trailing Pohnpei from the handoff. “I was pumped! The 400m is one of my events, as well as the 800m, and I love them so much. I knew that even though Shania was tired that she could book it; that girl is a really good sprinter. I saw that we weren’t in first, but my job was to get the lead and that’s what I did,” said an excited Madison. Having already ran the 100m hurdles and 200m, Richele was the third leg and she was ready to spend all that she had left. Then came the anchor and the pressure was all on Amparo. Despite losing a lead to Pohnpei through the first 300m Amparo’s game-plan played out just as she thought it would. The final 100m belonged to Celine as she stormed past Pohnpei for a decisive 4×400 gold medal win. Richelle Tugade will leave Yap with the most medals collected by a single Guam athlete in the 2018 Micro Games. After collecting four individual medals and two team medals, Tugade reflected on her Micro Games debut while battling some physical setbacks. “I feel like I’ve really earned some of these medals, but some of them I feel like I didn’t. Just because you medal in a certain event doesn’t mean you performed at your best. I’ve been sick for the past few days and I’ve had bad headaches, a nine-out-of-ten scale. I’d end up seeing double by the end of the day. My teammates were helping me get through those back to backs,” said Richelle. Yap got to witness the Tugade sisters in action, which has become quite the rarity given Regine’s hectic college schedule at the Naval Academy and Richele’s also busy high school career as a JFK Islander athlete. Although Regine’s Micro Games stay was brief, it meant something more for her little sister. “This is only my second international competition with my sister and it felt really great to share the track with her again,” said an emotional Richelle as she fought back some tears. Four events. Four gold medals. 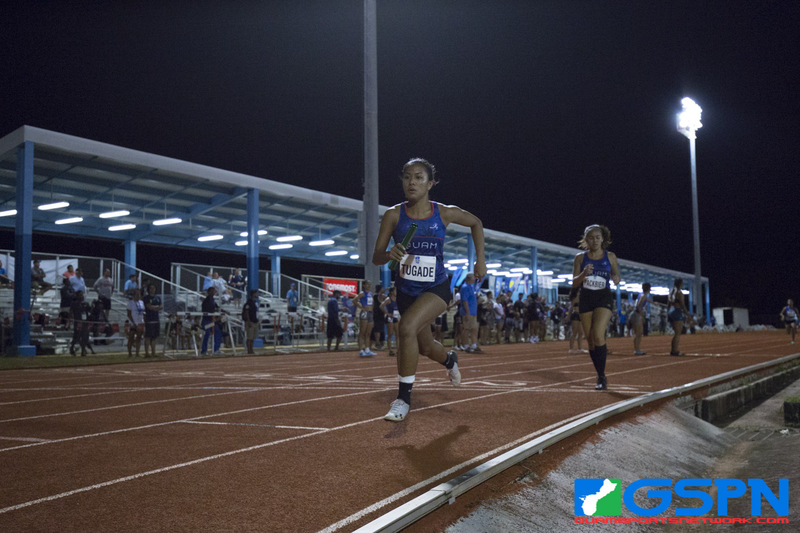 Genina Georgette ‘GG’ Criss wasn’t willing to settle for anything less as she will leave the Micro Games having collected the most individual gold medals for Team Guam. “It’s such a huge honor to be here in the first place to represent our island. There’s just no words I have to describe how I feel right now. I couldn’t have done it with my coaches, my parents and everybody else who has supported me,” said Criss. To ‘GG’, her most memorable event was the 1500. “I executed my race the way I wanted to, and even though I didn’t get the time I wanted, the effort was there and I’m happy with that. I had nothing left in the tank and I gave it everything that I had,” said ‘GG’.